Fest is over! My gigs are spacing out nicely! My house is starting to resemble a Home and not a Place Where All My Stuff Is ! My work is no longer a looming doom of Gods You Are Behind! Halloween is coming! And so is my Hot Tub, on Tuesday , in fact! I may yet rejoin the living. Or at least the Cheerful Un-dead. All is getting back to normal in my world, at least as close as it ever gets. In two weeks I go out to see our Malena for our favorite holiday of the year, yes, we will be webcaming or podcasting or Something for the big day, I am thinking. And in November, I am taking the entire month off from gigging. I am just going to write, and learn new songs and , I believe do some more recording. Sleep is still in short supply. Malena, the little Goth Betty Crocker , decided what she REALLY needed to make her home and world perfect was ANOTHER Boston Terrier. Now, these are pricy little dogs out in the Land of La-la, but here in the Midwest one can pick them up at the grocery store at a bargain price, so we , Malena, Mr Gorgeous and I, thought, hey, why don't I pick one out, and bring it next time I come out???!!!! What a perfect plan. I found the Baby easily enough, and was going to leave her with the breeder for three weeks , until said time of going out, but well, she was, uh, sort of cute, in a weirdo looking way, and lonely, and little and not really up to competing for food with the rest of the litter, and I thought, Hey! How hard can it be??? So what if I have never had a dog before? I mean it's just little????? Some things I have learned about Dogs. 1. Make sure it IS a dog. I am not at all sure this one is. It looks kind of like a cross between a Rat, Bat and Frog. 2. At 7 weeks they are NEW. Like a baby is NEW. This means they don't know ANYTHING and they are either full on party mode or sleeping. They will not sleep for long, only a couple hours. This includes the nighttime when you will want to sleep. 3. Everything you have heard or read about online about the Crate theory is wrong. They don't want to be in the crate. They will let you know this. It will sound kind of like Armageddon is happening in the crate. They want to be with you. All the time. 4. When they wake up Get Them Outside. Fast. The weird thing about dogs is that so much more comes OUT than goes IN. How is this possible????? Don't take your eyes off the dog for a second or they will Poo . EVEN if they have just been outside and Done the Business. They will still Poo if you don't watch them. This will make your Boss unhappy if you take your dog to work with you. 5. Don't take your dog to your gig. They will not sit nicely in the crate ( see # 3 ) while you play your lilting Irish Music. They will sit nicely in peoples laps or in beer pitchers. Your guitar player may take care of it during the breaks because these things are CHICK MAGNETS. 6. If the dog is small enough, put it in your purse when you go to the stores, shops or post office. You will meet a LOT of nice new people, and besides the dog does not like staying alone in the car any more than it likes the crate. Carry paper towels with you all the time. 7. They like cat food better than dog food. 9. Cats do not like them. AT ALL. Cats will look at you and let you know they are Very Very disappointed in you, how you could have made such a grievous error in judgment is beyond them, they will wash their paws of it entirely. Trouble Will Come Of This. 10. They are pretty cute, even if you are not sure your dog IS a dog, and it looks more like a Pig Dog Rat Dog Frog. It IS kind of cute. Entertaining as all heck too, in the party mode phase. They kind of do sort of a Hip Hop Dance type maneuver when they are happy and run, and they will be very fierce when they attempt to rend and kill stuffed fish or squeaking hedgehogs. When they sleep, which they like to do on you, they will melt your heart. And you will want to protect them forever. cutest pup in the land. Malena, how did the opening go!?! i am so sad to have missed it! Even though I'm a big dog/ big cat gal myself. And sure, there's the whole chewing and pooping. But Mad Max (who looks like he could be Misty the Wonder Cat's slightly scruffy brother) thinks all rolls of toilet paper are The Enemy and Must Be Destroyed. Hot tub sounds like Heaven, so enjoy. Thinking of music whilst soaking may be the Next Big Thing. CUTE!!! And yes, the modes will be Spazz and Nap for a while. It's more, um, *interesting* with two puppies as they gang up against you with plans like "you distract her by chewing her expensive Snoopy rug while I run and poop in the hall... I don't wanna go out because it's cold". Terriers are smart. TOO smart. I'm afraid I'd be so smitten I'd have a hard time parting with the little cutie. Do Boston Terriers eat tarantulas? Sue: You have a Pembroke or a Cardigan? Did I respond to your last email? Life's been crazy but I guess I wouldn't have it any other way. "The weird thing about dogs is that so much more comes OUT than goes IN." My mastiff is 11 months old and my husband and I have determined that he defies the laws of physics. He creates mass where there was none. I have never seen so much poo in my life. A lot of how much comes out is determined by what kind of food goes in. Lower-quality foods will result in a lot more poo, because they contain a lot of grains and other similar filler, which a dog doesn't digest too much of. Higher-quality foods, with more meat in them, are more digestible and result in less poo. Oh my goodness...it really does look like a cross between a Rat, Bat, Frog and Dog! Maybe something happened regarding its ancestry. Very cute, however! I'm glad to hear that your house is starking to come together. how are you planning to fly with tinka? she would be to small to go in the hold, wouldn't she? maybe an underseat carrier? should be an interesting flight, ie nature's calls, etc.! 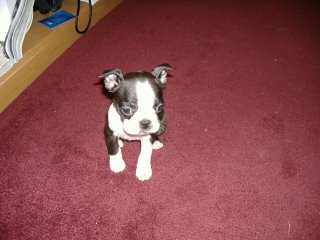 It's amazing how popular boston terriers are - at least 4 families i know have them -they are so cute and fun. Yes vanda, i got your e and saved it, will write this week, classes have been nuts - its midterms. and tank is a mutant pembroke - one ear never popped up, but as he is now sleeping on my lap, i just adore this dog - my first - i got him to help with severe empty nest last year - my husband moved to virginia, and my twins left for college, and a dear friend passed from ovarian cancer. very sad and lonely year, and tank helped immensely. tho he consumes more than his share of the couch, i have to balance my laptop on the couch back. If I may make a suggestion, puppies and dogs really are OK with crates, as long as the right associations are made with them. It should be their den and a place they associate with safety and security. If putting the dog in the crate is a precursor to leaving them alone for an extended period of time, then the dog will associate the crate with abandonment, which is Not a Good Thing. After our dog refused to go into the crate, we had one session with our dog trainer where he clashed the "rattles of justice" (2 empty plastic water bottles with a roll of pennies in each one, covered in a sock -- dogs REALLY hate the sound of these when you shake them) and generally tormented our new dog while we told him to "go home!" Running into the crate led to an immediate stop to the rattle and much praise and snacks from us. Brownie figured out what was what after 2 or 3 tries and has had no problems with the crate since. It's even one of his favorite places to snooze while we're watching TV. Working with a good trainer is worth nearly anything you'll have to pay for them. Ours was worth his weight in gold. Many thanks for the advice, everyone! I know nothing about dogs at all, this is a first. The puppy food is IAMS but she mainly eats the cat food which is Science Diet. I am taking her opn the plane with me, Malena bought the cutest little Pink Plaid Carrier for her.Any advice on how to make this trip without her freaking out or pooing and peeing????? What a cute companion for Stanzi! The reason Tinka likes cat food better than dog food is that there is more meat/protein in cat food. My cat wouldn't appreciate me bringing a dog in the house, either. Granted, at 9 1/2, he probably wouldn't be wild about a new cat/kitten either. That's one reason I have the dog outside. He'll be 10 within the next few weeks, and he ate lots of strange things as a puppy.....like a stick of polishing emery. Talk to the vet about doggie tranquilizers for the plane, and other things. If she's comfortable riding in the car, she'll probably not freak out on the plane. When they're this young, they nap a lot (as you've noticed). Puppies can only "hold it" for about 4 hours so chances are there will be a "bonus" in the carrier. Get some piddle pads (they'll know what they are at the pet store.. they're similar to a diaper but you put it on the floor) and put one in the bottom of the carrier to absorb any pee. Any poo you could remove with a kleenex and flush it, if you notice it. Bonus for small pups: small poo. If you try to diaper the puppy, it'll probably just chew it off. Everything I've read about flying with pets says to not feed them before getting on the plane in order to lessen the chance of stomach upset. You can ask the vet about sedatives, but unless the pet is really spazzy and upset, they usually don't recommend them since they can interfere with breathing and body temp. I'd imagine that's especially true with a puppy. Put her favorite chew toys in the carrier so she won't be bored. I sat next to a woman with a mini dachshund and it was quiet as a mouse the entire flight from LA to Indy. She'd reach down and into the carrier every so often to pet it, but it seemed to be content with travel. Double check with your airline about carrier size so there's no surprises at the gate. Tinka really is too little to fly in cargo. I wish I were closer, I'd love to see her! I'm betting Non Birding Bill is smitten... 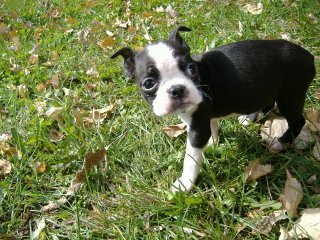 I know he's a Chet Baker fan (Julie Zickefoose's Boston Terrier). yes, it is rather an odd beastie. i gew up with a german shepard and several cats, and developed the theory that, if a dog can get eaten/stepped on/tripped over/sat upon by a cat, then it is not really a dog. 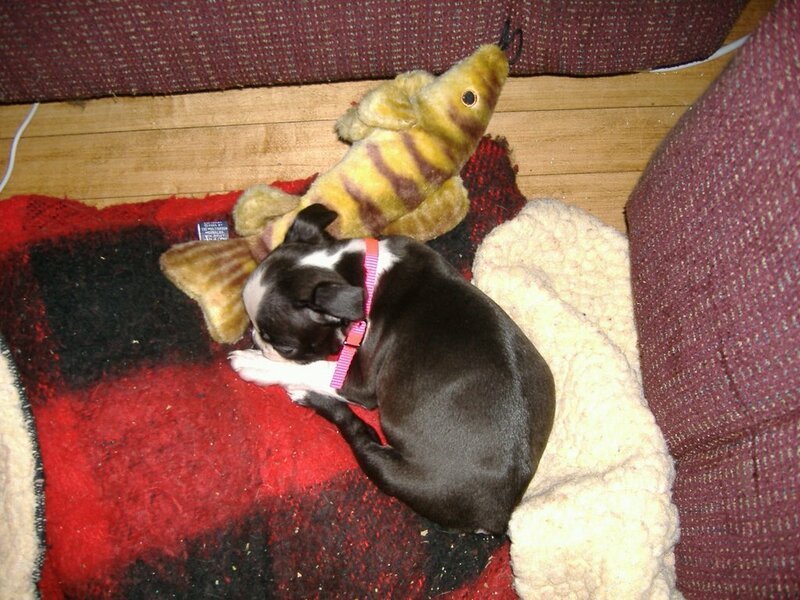 but the frog-bat is endearing in its own cute-overload way... :) and yes, puppies and babies are chick magnets. and as much as I am a cat person the bat-frog-rat-dog is pretty cute!!! Whoa! Beautiful puppy! You must post more pictures of him when you can. dPLGnC You have a talant! Write more! gL2VJD Please write anything else! aRjZD0 The best blog you have!